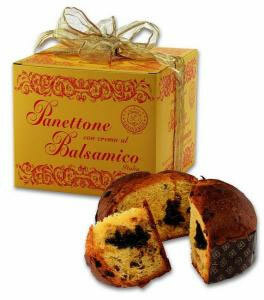 Classic Panettone with Balsamic Cream...a luxurious, incomparable presentation of the traditional panettone! Classic Panettone with balsamic cream is made by the Leonardi family in a town near Modena, "Magreta di Formigin", a producer known for their balsamics for over a century. Panettone with Balsamic Cream...a unique, well-balanced, naturally leavened panettone with with small pockets of balsamic cream & raisins. An incredibly soft & fragrant classic panettone with the sweet, rich balsamic cream preserving both the aroma & taste of a fresh-baked panettone. Leonardi Classic Panettone with Balsamic Cream. Size:750 gr. / 1.7 lbs. Gift Boxed with a hand-tied ribbon.